The blurb: Are your technology projects inspired more by the latest bell or whistle instead of what will pay off for your library? Do your technologies deliver both the steak and the sizzle? This panel presentation will outline cost/benefit analysis and case studies for justifying technology projects to administrators and funding agencies. 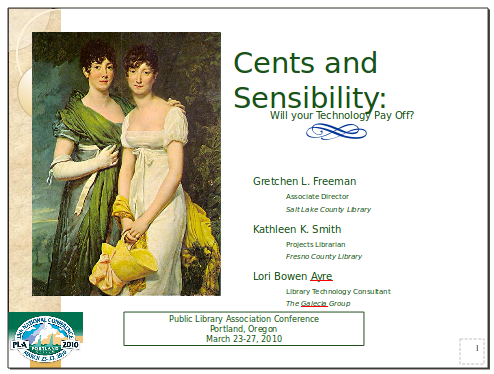 Whether you are vying for large or small dollars, show how a technology investment delivers both "cents and sensibility" for your library.